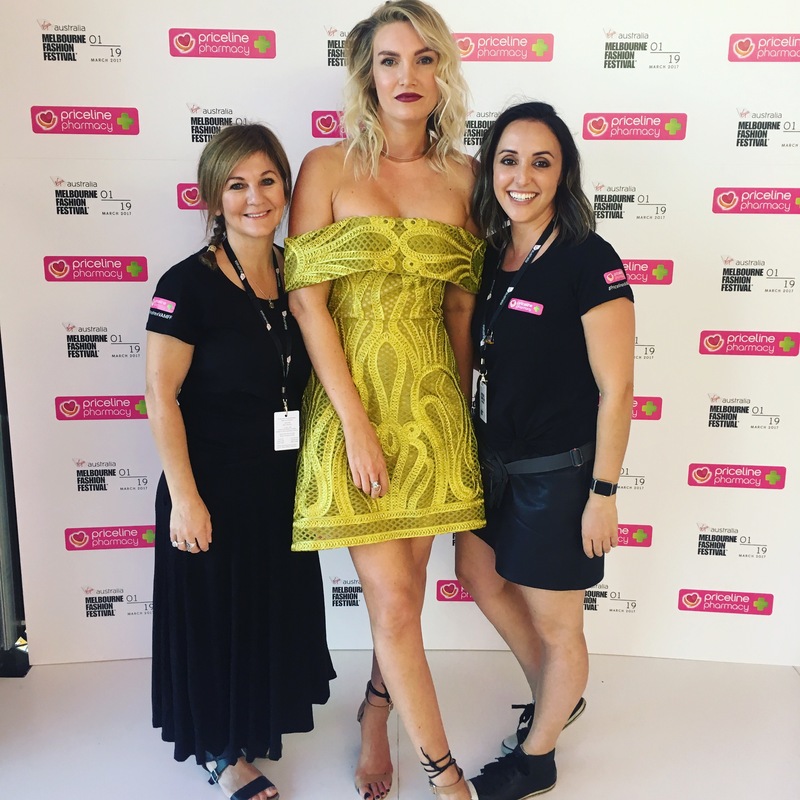 Once again, Priceline Pharmacy was the official hair and beauty partner of the Virgin Australia Melbourne Fashion Festival 2017. And when it comes to beauty, no one is more qualified. I was more than happy to let their beauty advisors loose on my hair and make-up. MAKE-UP: When it comes to asking me “how do you like your make-up” my response is always – “heavy!” Ha, ha. My lovely artist was extremely obliging and selected for me the darkest shade of lipstick she had in her arsenal – a deep burgundy shade by Australis. Amazing staying power, by the way. My eyes were also a shaded in soft hues of burgundy and the look completed with highlighter on my cheekbones & browbones. HAIR: I had the dream team of Julie Bekiri & Margo Orsatti whipping my hair into shape. (Pictured below). These ladies quickly got to work taming my locks with Schwarzkopf styling products and curling irons. In no time at all, I had hair full of body and perfectly flicked to one side. This would have taken me at least 45 mins to do myself, and wouldn’t have looked half as good. Thanks to Beckon Media for the beauty shoot. Just another perk of the amazing Priceline Beauty Lounge. See finished result below. They ran us through the look for the evenings show: Graphic lined eyes with fresh dewy skin and romantic yet tamed hair. The juxtaposition between soft and strong came together to create a dramatic runway look. Supermodel and all round stunner, Sam Harris shows us how to wear this look below. On a side note – my room at QT Hotel was amazing! I’m a bit of an interiors geek. I describe my style and natural industrial with dark tones and clashes of colour… and I felt like somehow QT got the brief in advance and prepared my room accordingly. I spent the night trying to work out if I could turn my apartment into a replica of this beautiful space. All photos (unless noted) by me – and my tripod – shot on Canon EOS 6D.